2018 is the final year of the period to carry out the Showa Denko Group's medium-term business plan "Project 2020+." These days, it is difficult to forecast economic and market environments. Moreover, economic environment rapidly changes, and global competition is intensifying. 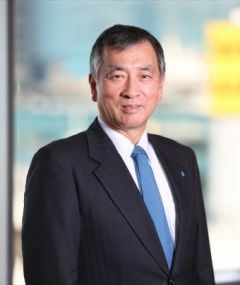 Under these circumstances, in order to remain undefeated, the Showa Denko Group must grasp changes in wind direction in its business environment, and have corporate character which can immediately cope with any wind direction and maintain high-levels of profitability and stability concurrently. All of our stake holders expect us to prosper "now" and "in the future." It is not too much to say that whether the Group can prosper in the future or not rests on shoulders of you who joined us today. I hope you to bring the Group a wind of change. I request you to take three actions as in below. I ask you to think "What do I want to do?" and "What can I do?" for the growth of the Company and yourself. Even thinking about trifling or small things can work. I also ask you to embody your thinking step-by-step. Mr. Nobuteru Mori, the founder of SDK, had a motto of "Dauntlessness and Indomitableness." I hope that you keep a mind of "never-give-up" and add to it flexible thinking, thereby producing many alternatives that lead to future prosperity. Under the circumstances where market environment and society change dramatically, we must continue changing ourselves freely. Those who can change themselves can change the Company and society. Please rise to a crisis, have no fear of changes, and rather, enjoy changes. The Group has diverse human resources, products, and technologies. In order to make the most of them and bring innovations to society, every employee must "communicate" actively with each other, respect individuality, and work cooperatively. I hope you establish an identity to "communicate" actively with people around you.